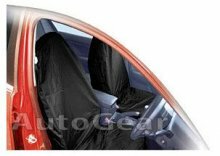 1 Pair hi-back seat protectors. Will protect upholstery and keep the original seats like new. Easily cleaned with a damp cloth/sponge. Resistant to Water, Oil, Grease, Paint, Mud, Children's Spills, Food, Drinks and Pets. Classed as a Universal Fit therefore is suitble for most standard seats.